Step 1. Heat oil in a wok or large frypan. Slice white part of shallots, reserving green parts. Add shallots, garlic and ginger to wok and cook over gentle heat for 1 minute. Add carrots and cook for 2 minutes. Add zucchini and peas and cook for a further minute. Step 2. Add chicken, sauces and sesame oil and cook for 2 minutes. Step 3. Remove core from lettuce with a sharp knife. Gently pull apart lettuce leaves and trim with kitchen scissors. Chill until needed. Step 4. 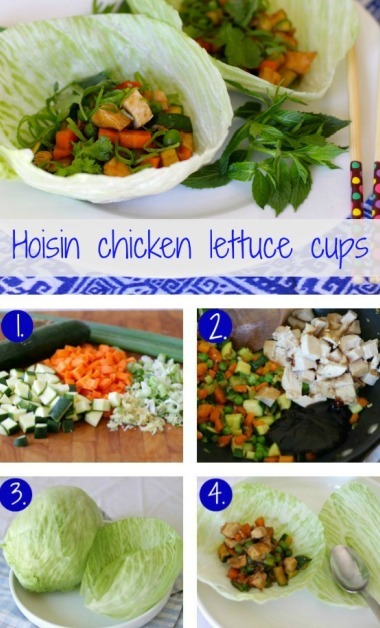 Fill lettuce cups with chicken mixture. Top each cup with some coriander and finely sliced shallot greens. You can use whatever vegetables you prefer – capsicum, spinach and mushrooms would all be lovely. Washed and well-dried butter or gem lettuce would also be suitable. You could use this mixture cooled and wrapped in rice paper rolls. Barbecue chicken is so convenient and you could also use it in this delicious Asian chicken noodles recipe. The flavours are similar. This BBQ chicken and rice salad is great picnic food for the family and packs well in a cooler bag. If you need to get a quick dinner in the oven then this BBQ chicken pasta bake will cut your cooking time in half. Have you ever done the shopping and got all of the groceries home only to find that you are too tired to cook? Well this BBQ chicken salad for the exhausted shopper is the perfect recipe for you. Have you ever had a sick family member and needed chicken soup in a hurry? Try Katie's chicken soup recipe recipe. It's maximum impact with minimal effort. You can also use a barbecue chicken in Chicken BLTs, Chicken parcels and Chicken pasta salad. Just bring it home in the bag and strip all the lovely moist chicken meat off for a super-fast kitchen shortcut.